Today's update is going to be very short and sweet, due to time constraints I ran into with some family issues. There are two reasonable ways to view the most recent action, as shown on the chart below. The good news for bears is that the rally is almost certainly corrective, and should ultimately resolve with lower prices. The question is more whether it will do so more directly, or if there's another run-up still left. 1. It is a complete w-x-y double zigzag, and the next wave down has begun. 2. 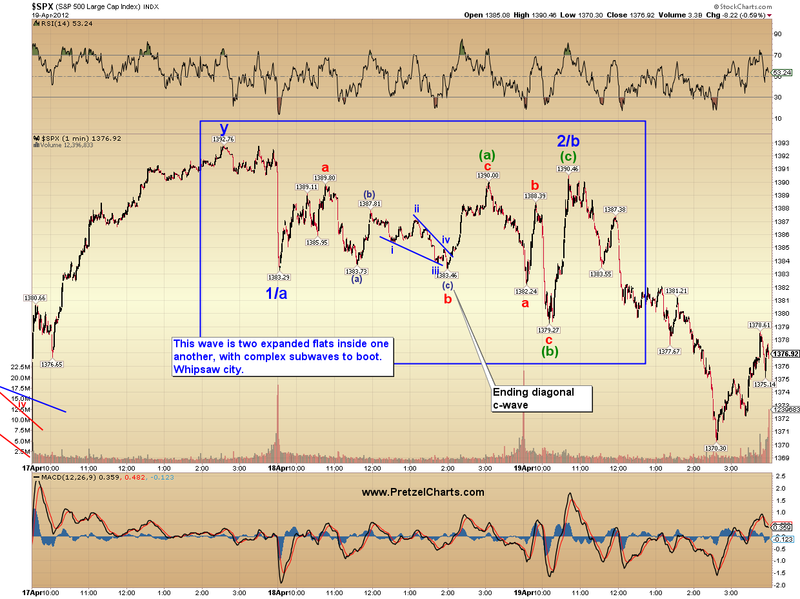 It is an incomplete double zigzag, and yesterday's action completed the b-wave of said zigzag. I've marked a few levels to watch on the chart. In any case, it is thus far extremely challenging to count the rally as an impulsive form. If it's a motive wave, it would have to be counted as either a leading or ending diagonal. It's very challenging to see it as anything overly constructive to the bull case. In conclusion, the next wave down may be underway, and that's the interpretation I'm leaning toward -- although just barely. Part of the reason I'm leaning that way is because the Euro has been rallying all night, and just tagged 1.32075... and I think it's now on the verge of a steep decline. So I'm factoring that in as the final straw. It's possible my Euro analysis is wrong, since I lack the market confirmation I need regarding a decline in Euro (no key overlaps yet), and so I may be factoring in something that isn't going to happen! The equities decline could have been a b-wave, with c-up to come. The key level for that argument would be 1390.46. Trade safe. At the request of a reader, here's a quick breakdown of the correction that came on April 18 and 19. This is why it can sometimes be challenging to figure out exactly what the market's planning -- it's virtually impossible to predict a wave like this in advance. Good morning Jason. Hope all is well. Thank you for the update. Glad to see family is first. should be a drop coming up soon. . . . I just added an addendum chart at Whip_sawed's request, showing how to break down the move of the last 2 days. Good choice PL and I am sure that today's update is not the third wave. Euro bears need to push through here for it to stick. The Aussie dollar looks like it's gonna bounce today to finish a 4th wave. As a result, the Aussie:Yen cross is doing the same thing. Since their correlations with equities are remarkable, I'd say we rally all day long and tank on Monday. Might even start to tank late today. I don't pretend to know for sure, but I 'do' know that that particular currency pair is more accurate at forecasting the equities markets than the equities markets themselves, lol. LOL...that too damned funny...options humor...whodathunk. I think you should hire yourself out to the BSDs for their get togethers. Oh man you wouldn't believe some of the stuff I come up with. I've cracked up some of the people I've worked with so bad that they've peed their pants. One lady actually peed herself I made her laugh so hard. I don't even know where that stuff comes from. My brother (God rest his soul) was the same. An interesting chart someone posted a while back on Daneric's blog that historically maps market behavior around OPEX. *Usually*, the decline starts after OPEX. You have full support from your crew captain. Family is far more precious than most of the scurvy dogs who swab these here decks. This morning at least looks completely untradable. Great chart. I wish I would have seen this yesterday. Howdy.....appears as though I just made it for the next wave down. Shall we do a three wave down from here to break below 1370? Thanks for telling us today. SG I hope you are right. FWIW (and forgive me for harping on this but...) I'm so confident in the corruption at JPM that I'm totally convinced they're going to run IWM all day long and pin it just below the max pain number which is at 82. If you're trading ES or anything else for that matter, you might consider taking your cues from the Russell. I would expect today's action to be a clean 3 wave sequence. But if not... if it's straight up, then we're probably looking at something more bullish. I don't think that happens though. Potentially setting up for a blood bath on Monday. I'd say that if we get a clear 3 wave sequence today and finish on the high, short the hell out of it. Rhe move up so far is extremely impulsive. I think we see a clear 3 waves up today which would set up the 'down hard' that you're expecting to happen on Monday. Question: If the invalidation for the ST SPX bear count was identified as yesterday's HOD, would the same be true for RUT? it just broke though so is it reasonable that SPX would follow suit? i will call it ....W5 of 1 of 5 UP UP and AWAY! No comments for like 30 mins...something wrong with disqus?? Consolidation (correction) for last 45 mins...chart tells me it breaks up (but i'm a newbie), gut tells me down. Let's see if there's a head fake to REALLY screw me up. Any nat gas EW charts? Would love to see one. My confidence in any short-term counts right now is low. Very impulsive looking rally so far -- not surprising because this range has been traded often enough recently that there's little resistance (or support) thoughout. Yup, these pictures are telling the truth with humor. Kinda like the Nancy Grace show. Pretzel, no need to apologize about the post: family does come first; I second all the like-wise sentiment here. Thanks so much for the RUT chart. It is way over my head though. Correctives seem to be the bane of my EW skills. I have F&P and Neely (still struggling to get through). Are there other EWT resources you'd recommend? Is it the amount of overlap that leads you to conclude those waves were corrective? I'm keeping a close eye on the RUT and your invalidation level. So far RUT is hugging the underside of a major trend-line. My hope is that the trendline provides enough resistance to keep a break-out from occuring and then the iii wave of the bearish ST count kicks in. I stick with spx only. Sometimes look at rut. Looks like could not break thru HOD. Might short soon. Still non-committal. Is that a mini cup an handle forming forming on the 5 minute ES/SPX chart? PL, im kinda lost in your blue count. you have yesterdays low labeled as i, but with an abc blue down to it. how can a first wave be an abc? thought its supposed to be a 5? think i must be missing something. Yep, looks that way to me too. Almost too straightforward. Overlap invalidates certain potentials, so you're able to determine corrections that way to some degree. I'm short E7 just off the recent high. Not sure exactly what to make of it, but I think it's at least due a correction here. Whoops, it should say "i/c" not "3/c". I committed...now a little move to give me a buffer zone would be nice. Oh, and the blue a-b is a-b to 2. The c isn't labeled because it's assumed. these are those little EW5 suckers that are really hard to read. . . Looking at a long term P&F chart of SPX, it has formed a wedge and now it is decision time. It can keep going sideways but this chart won't change anymore if it does that. 1360 signals a reversal and 1350 is a double bottom sell signal. It would have to reach 1430 to create a new buy signal. if we get some overlap of A -- down into the D area...then a new high for the day... that would be an ED in the 5th position... and i would be more aggressive taking on a short position there if we do get the ED rather than if we don't. Yeah, I can hardly think of any other human being who turns me off as much as that scowling negative windbag. I'm thinking along the exact same lines except that this bounce today is so impulsive that I think it would only the 'a' wave of a 3 wave sequence. I was hoping to see all of it today but that seems quite unlikely now. TLT continues to rally from the low on 3/20 at $109.69 to a high so far of $117.60. Bonds are suppose to be the "smart money" players. Just drifting down...I'm still in my original short from near the top. Rooting for your candle. red 1 min bars getting going. is this it? The flux is in alignment with that notion of yours. Took 30 mins...but there's your candle. this is pure speculation. ES seems to be running about 4 to 6 points above and below my tgts. I mentioned that I felt we were in an oscillating mrkt and ES is trying to make up its mind. I am thinking bearishly, think at some point it will snap into a longer term down channel. This is not trading advise and we can only confirm this if/when it creates the aforementioned channel. $INDU run to plus 115, now back to 82. Decision time. . . .
Don't take time to thank us....you could miss somethin! Bank it when you can.....mama need a new pair of shoes? I do understand that part, just trying to figure out why they are called 'cars' since that is an interesting term. Thanks! Wish I had read this a few mins ago...I got out +1200, and then looked back at market and it dropped to the recent low...now moving through...damn those seconds...probably cost me 1000. But...Im out and I'm up. nice, nice, nice !!!!! I went short again at the top of that bounce off of 78. For noobies, the tgt levels I post are support levels down below (or resistance levels up above), a potential pivot, it comes down, hits that, then bounces to usually about 50% of the distance it traveled down. I reentered my short position there. A bounce off the tgt does not mean it will rise 50% then test that level again, it could continue going back up, you do not know. but I saw the breakin of many EWs on lower time frames so i am staying to the short side now. Couldn't happen to a nicer bank. DO YOUR OWN RESEARCH. . . . .
my posts are just guideposts so you look at your charts to see what has changed, I am paying it forward. . . While Pretzel's away.....the equities play! if it breaks 1375 ES think all over for upside potential, IT notice it bounced right off if there? Nice guys....Let it get back to $4.96 again. I think that was B of the final ABC in the pennant/flag/diagonal 4 that started from the 4/10 lows. This last C should get us to the upside target of 1397 SPX. 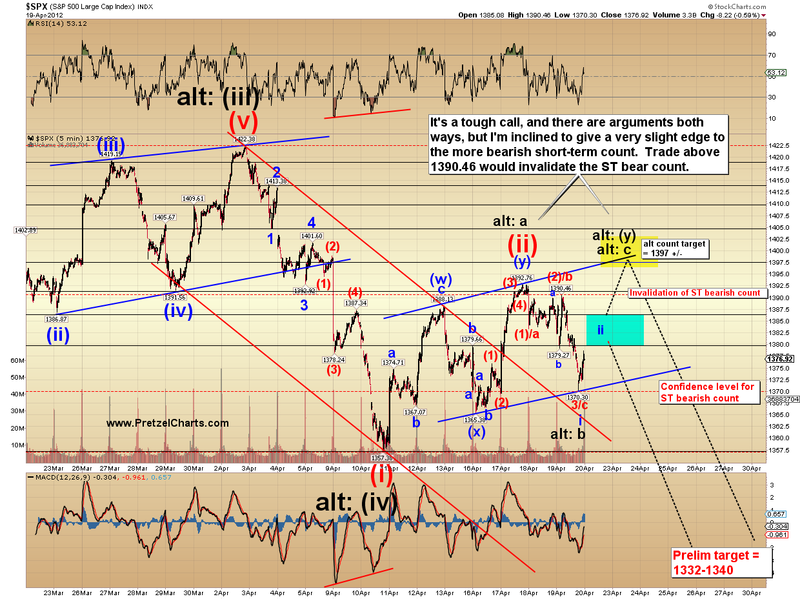 i've got it as a 3 wave correction down to SPY 138.05 ... new low below there it becomes a 5 waver. tgt by EOD, now, don't f-ing come out of the woodwork and say I got this wrong ! lol .. . . and don't trade off of this. First, eSignal is very expensive, 3 to 5,000 to buy in, $140 a month for ES feed. The EW plotting is auto but it is not that simple; if it was everyone would buy the program and make a trillion dollars in the first year. I teach eSignal EW to ppl for free; I do not represent the company and do this in the summer out of the goodness of my heart. I only trade my own ideas, but it is always nice to get some confirmation or challenge from someone more knowledgeable. I appreciate the notes to newbies. All info is much appreciated. I am flat for the weekend. NDX and COMP leading this down.........really need RUT to POOP!!!!!!!! I have some time now, nothing is happening, go look at my posted 120 ES chart. See the fib. retracement level? I think the first down was a minor EW1 off of the EW4, the rise up to where my arrow is the EW2 retrace. I think we are now moving into an EW3 down move. I could be wrong on this and will reevaluate it in a split second if need be. Second, the last two hours of OPEX are usually flat. From what I see today could be the exception to that rule. VIX wants to climb up. Pardon my ignorance if this has already been taken into consideration, but would adding in overnight trading of the S&P 500 futures add value to the count.....or detract? "personally i prefer stupidity"......."no,no....pride will do".......what great movie??? You really should...helluva nice couple of trades to day. I am wincing that I got out too soon. Well done! This is what I do when trading, don't watch news, don't really care but understand I can get wacked by some notable event at any time. giarc is here? plz post more guy ! any one BTD aapl here? or wait till 550? I'll definitely try to Katzo. Quick question for you. What are the black bars on your stoch charts? I think you said once that they indicate whether we are in a buy the dip or sell the rally mode. Is there a name for the indicator? Also want to say that all of your posts are helpful and appreciated. how about an EOD covering pop so i can put a few easy shorts on ?! correct you are........one of the best ever!! they are False Bar Stochastic bars, not the best term for them, proprietary calc in eSignal. They say to buy or sell the mrkt when the stochs hit the opposite side. Remember, the FBS under an EW5 or a C wave is void. Doom Merchant made a great call yesterday, I did not see it in the charts, I was packing up to leave my office.